A jingle bell or sleigh bell is a type of bell which produces a distinctive 'jingle' sound, especially in large numbers. 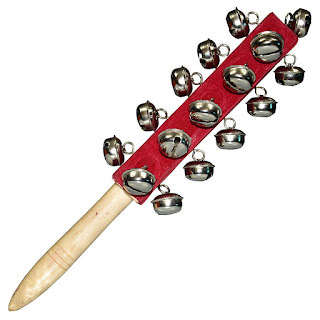 They find use in many areas as a percussion instrument, including the classic sleigh bell sound and morris dancing. They are typically used as a cheaper alternative to small 'classic' bells. The simplest jingle bells are produced from a single piece of sheet metal bent into a roughly spherical shape to contain a small ball bearing or short piece of metal rod. This method of production results in the classic two- or four-leaved shape. Two halves may also be crimped together, resulting in a ridge around the middle. A glass marble may also be used as the ringer on larger bells.